In 1989 Sunny Cooper escaped to Albuquerque. Fourteen years later she’s still there, struggling to make a living, to shore up her floundering relationship, and to forget her childhood on the New Mexico commune, Armonía, where a freak accident killed her younger sister, Mari. 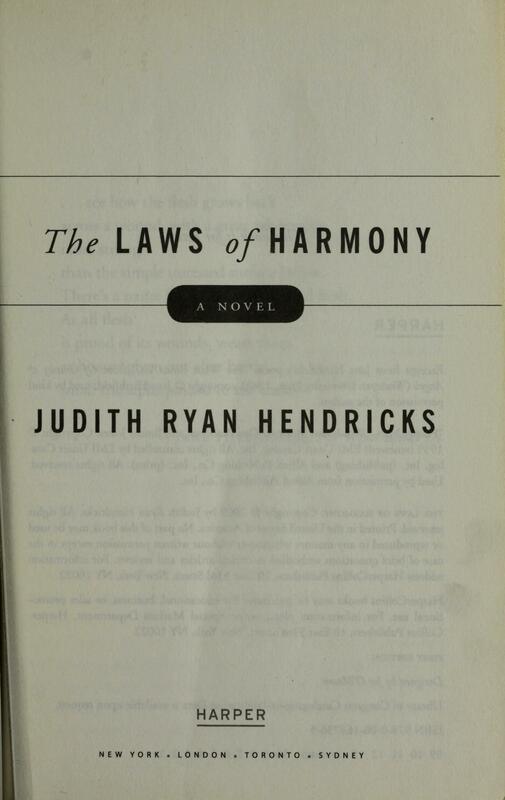 Judith Ryan Hendricks, a former journalist, copywriter, computer instructor, travel agent, waitress, and baker, is the author of three previous novels, including the bestseller Bread Alone. She and her husband live in New Mexico. What does Sunny Cooper’s flexible assortment of occupations—voice-over artist, personal errand runner, obsessive baker—suggest about her personality and her professional focus? How do the suspicious circumstances surrounding Michael Graham’s death and his behavior prior to his disappearance make him seem like a stranger to Sunny? How do the detailed descriptions of food and cooking in The Laws of Harmony affect your reading experience? Which were most memorable to you and why? Why does Betsy Chambliss conceal her betrayal from Sunny, and could there be any possible justification for her behavior? How does the tragic death of her younger sister, Mari, factor into Sunny’s feelings about growing up in the commune in Armonía? Sunny can’t wait to get away from Armonía, but after almost fourteen years on her own, the normality and stability she craves still elude her. Why is this? To what extent is the summer idyll with her grandparents in California responsible for her sense of living an unmoored life? Why do you think the author chose to explore the strange coincidence of Sunny’s having been raised in Armonía, and her having turned up in a town called Harmony? What does this convergence suggest, and to what extent do you think the names might be intended ironically? How would you characterize Sunny’s feelings about her mother, Gwen, returning to her life? To what extent is their relationship irretrievably fractured? What does JT’s reaction to the news of Sunny’s pregnancy reveal about his character and their romantic potential as a couple? What do you think the ending of the book suggests for Sunny, her future life in San Miguel, and her relationships with JT, Gwen, and the others on whom she has come to depend?